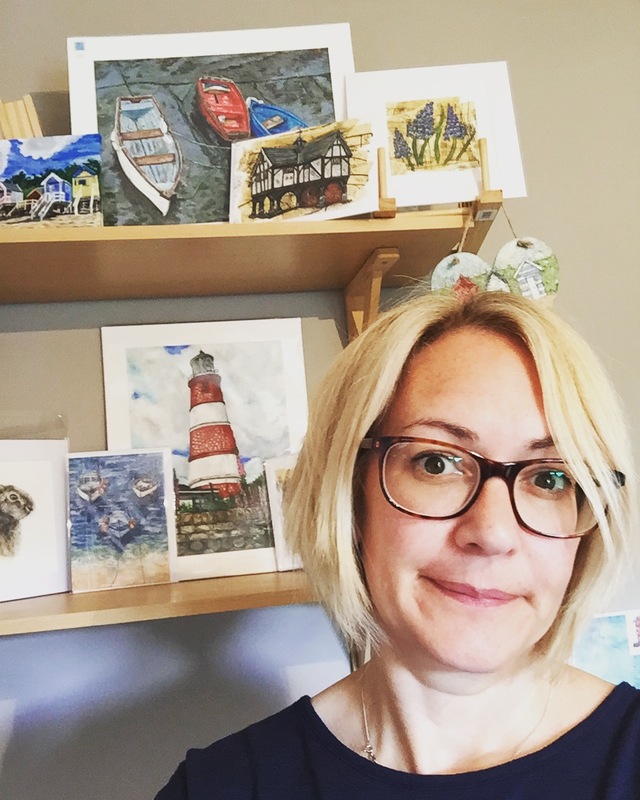 I love spending my time working with print, pencil, patterned paper and paint, creating mixed media artworks that are rich in texture and colour. I find it hard not to draw on my Suffolk coastal roots for inspiration; from the brightly painted beach huts along the prom at Southwold, to the rickety fisherman sheds along the river Blyth. Harbours at Lyme Regis, St Ives and Tenby have all caught my eye, with rows of boats abandoned at low tide or bobbing in the water. My current home county of Leicestershire is also full of amazing buildings and countryside that continues to offer a wealth of inspiration. I also enjoy creating paintings with a floral theme, collaging with printed paper bases and adding colour and definition into each piece. More recently I have created commissions of family pets and have enjoyed the challenge of bringing the dogs personality into my work. Basically I love transforming a blank piece of paper or canvas into something full of colour and life!